The psychology of fitness, sport and specifically CrossFit has not stopped being a surprise to me ever since I began working in this industry many years ago and anyone who has ever tried the sport will immediately identify with what I am talking about. There are so many different factors we could write about but today I want to concentrate on the psychology of scaling and modifying movements. I work with injured clients every day, many of whom participate in CrossFit or Weightlifting and it is a great concern to me how many of these clients struggle with the idea of having to change a movement within a workout due to an injury. I’ve known several clients to avoid me (hahaha) just so that I won’t stop them from doing certain exercises and I’ve had plenty turn up for their Physio sessions with their tail between their legs confessing that they still did all the things on the list I recommended changing (insert smiley face). Believe me when I say I get it. If the pain is not that bad why listen to it? Or how about, “but I like doing the same thing that everyone else is doing”. Definitely one of the biggest drawcards to CrossFit is the community and whether it’s corny or not, the sense of belonging. As soon as you do something different it immediately means you stand out. Not a feeling that many people are comfortable with. However, quite often our thought patterns do not match our goals. 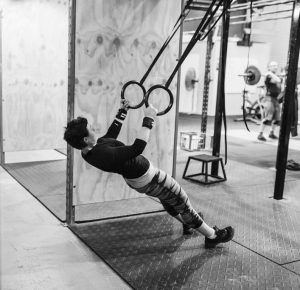 Such as wanting to do CrossFit for health and fitness, lifestyle and stress management but forgetting to consider that injuries not managed properly WILL get worse and eventually will interfere with your ability to do CrossFit at all. Not an outcome that is desirable when you wish to maintain health and fitness or stay within a sport that you love. If you take competition out of the equation (because let’s face it most of us who do CrossFit are not competitive athletes) then I want you to consider why it is so terrible if you have to substitute an exercise for an alternative (but still valuable) exercise? Let me give you an example, you cannot perform pullups without pain but you can do bicep curls and/or ring rows? All three movements still lead to gains in fitness, strength and endurance so the outcome may still be positive. However, you might argue that these movements are not as difficult in which case I propose that you make sure you program the substitute movements in such a way that you meet the challenge you desire. You can increase weight or volume or body position to achieve this. In my experience a good program tailored around injury will still eventuate in gains for the client down the track. This includes basic rehabilitation programs eliciting marked improvements in body awareness/fundamental stability/balance and more. Just remember there is value in everything you do! Value in isolated muscle exercise. Value in modifying cardiovascular exercises to ones that don’t hurt. Value in going back to basics. Value in working on your flexibility. VALUE IN TURNING UP! So please, when you are injured seize the opportunity to work on other aspects of yourself and your training and don’t allow your mindset to interfere with what is actually in your best interest.